Stephen Orr Spurrier (born April 20, 1945) is a former American football player and coach often referred to by his nickname, the "Head Ball Coach". Steve Spurrier was born in Miami Beach, Florida and grew up in Tennessee, where he was a multi-sport all-state athlete at Science Hill High School in Johnson City. He attended the University of Florida, where he won the 1966 Heisman Trophy as a college football quarterback with the Florida Gators. The San Francisco 49ers picked him in the first round of the 1967 NFL draft, and he spent a decade playing professionally in the National Football League (NFL), mainly as a backup quarterback and punter. Spurrier was inducted into the College Football Hall of Fame as a player in 1986. After retiring as a player, Spurrier went into coaching and spent several years as an assistant at several college programs, including at Duke University, where he began to develop his innovative offensive system while serving as the Blue Devil's offensive coordinator in the early 1980s. He was hired to his first head coaching job by the Tampa Bay Bandits of the United States Football League (USFL) in 1983. The USFL folded after three seasons, and Spurrier returned to the college ranks, serving as the head football coach at Duke (3 seasons), Florida (12 seasons), and South Carolina (10.5 seasons). Between his stints at Florida and South Carolina, he led the National Football League's Washington Redskins for two seasons. Spurrier retired from coaching in 2015 and became an ambassador and consultant for the University of Florida's athletic department, though he briefly returned to the sideline as the head coach of the Orlando Apollos of the short-lived Alliance of American Football in 2019. He was inducted into the College Football Hall of Fame as a coach in 2017, making him one of four members to be inducted as both a player and a coach. Spurrier's teams were known for winning with aggressive and high-scoring offenses, and he became known for teasing and "needling" rivals both before and after beating them on the field. He is the winningest coach in both Florida and South Carolina program history, and his last Duke squad won the program's only Atlantic Coast Conference (ACC) championship over the last half-century in 1989. Florida's four consecutive Southeastern Conference (SEC) championships in the mid-1990s is the second-longest streak in conference history behind Bear Bryant's 1970s Alabama teams, and Spurrier and Bryant are the only coaches to hold the record for most conference wins at two different SEC schools. Spurrier is second to Bryant in total wins while leading an SEC program. When Florida quarterback Danny Wuerffel won the Heisman Trophy during the Gators' 1996 national championship season, Spurrier became the only Heisman Trophy winner to coach another Heisman Trophy winner. In September 2016, the University of Florida officially renamed the Gators' home field to Steve Spurrier-Florida Field at Ben Hill Griffin Stadium. Steve Spurrier's skills as a young baseball player caused a local businessman to talk the Reverend Spurrier into coaching the Little League team sponsored by his business so that Spurrier's son would be on the squad. The younger Spurrier has often repeated an anecdote about playing baseball on a team coached by his father. "How many of you believe that it's not whether you win or lose, but how you play the game, that counts?" the elder Spurrier once asked his players. When some raised their hands, he told them, "Well, I don't believe in that saying. If they're keeping score, we're going to play to win." Spurrier was Science Hill's starting quarterback for two years, during which time Coach Kermit Tipton installed a passing offense to take advantage of Spurrier's talents and occasionally allowed him to call plays. Boosted by a post-season game at the end of his senior year in which he brought the Hilltoppers back from a 21–0 second-half deficit to win 28–21, Spurrier was a high school All-American and drew the attention of many college programs. After winning multiple all-state honors in high school, Spurrier was recruited in one or more sports by many colleges, including Alabama, Georgia, Mississippi, North Carolina, Kentucky, Duke, South Carolina, and both Air Force and Army. However, he was not aggressively pursued as a football player by the coaching staff at the University of Tennessee in nearby Knoxville because at the time, Tennessee ran a wing-T offense that featured a running quarterback while Spurrier was an excellent passer. While Tennessee never officially offered him a football scholarship, Volunteers basketball coach Ray Mears offered Spurrier a scholarship, which he declined since he preferred to play football. University of Florida coach Ray Graves heard about Spurrier late in the recruiting process from his brother Edwin, who was the postmaster in Knoxville, and visited Johnson City in February 1963. Spurrier and his family got along well with Graves, and Steve visited the Florida campus in Gainesville the following week. He received a favorable first impression of Gainesville when he arrived to find warm sunshine after leaving freezing temperatures in Tennessee, and thought more highly of Graves when the coach stayed by his side in the school infirmary after Spurrier's cold worsened into the flu during his recruiting visit. Graves did not promise Spurrier that he would be his starting quarterback, but he told the star recruit that he fit into his coaching staff's plan to open up the Gator offense and would be given a fair opportunity to earn the job. Soon after returning home to Johnson City, Spurrier agreed to attend the University of Florida because of "the passing, the SEC, the weather, and coach Ray Graves." The 49ers began the 1975 season with a 2-5 record, prompting Spurrier to ask Nolan for a chance to start against the Los Angeles Rams, who had dominated the rivalry during his tenure in San Francisco. Nolan agreed, and Spurrier led his team to a 24-23 comeback win, throwing for 240 yards and three touchdowns with no interceptions in what he later called his "best, or at least favorite" game of his pro career. The performance earned him the starting job, and the 49ers won the next two games behind Spurrier to get back to 5-5. However, they lost their next four games, Spurrier was sent back to the bench, and Coach Nolan was fired at the conclusion of the season. Incoming coach Monte Clark traded multiple high draft picks for New England Patriots' quarterback Jim Plunkett, making it clear that Spurrier would not be a part of the 49ers' rebuilding plans. Overall, he was 13-12-1 as a starter with San Francisco. In April 1976, Spurrier was sent to the expansion Tampa Bay Buccaneers in exchange for two players and a second round draft pick as part of the new franchise's first trade. The Buccaneers' new acquisition generated local excitement, as Spurrier had been a college star at the nearby University of Florida. He won the job as team's first starting quarterback, a position that he later regretted as the undermanned Bucs went on to suffer the first winless season (0-14) in modern NFL history. Though he had looked forward to playing professional football in Florida, Spurrier was frustrated by losing, the constant hits playing behind a porous offensive line, and his philosophical differences with Bucs coach John McKay. McKay insisted on employing a run-heavy attack similar to the offense he had used to win championships at The University of Southern California, while Spurrier felt that the team did not have the right personnel to run the ball effectively and should open up the offense. Another point of contention was Coach McKay's insistence that his son, John McKay, Jr., be the Buc's primary wide receiver while Spurrier and other observers felt that he did not have the talent to fill that role. Spurrier spent fall 1977 out of football, living in Gainesville with his young family and considering possible career choices. While not officially connected with the University of Florida at the time, he was often on campus, running at the university's track and attending football games as a fan. He watched the Gators play to a 6–4–1 record in 1977, a season that prompted head coach Doug Dickey to scrap the wishbone-based run-heavy attack that his teams had used for several years with declining success in favor of a more open pro-style offense. To effect this change, Dickey revamped his offensive staff, and he hired Spurrier to his first coaching job as Florida's quarterbacks and receivers coach. The changes did not bring many positive results. While Florida's passing attack improved, the 1978 Gators' overall scoring output was almost identical to that of 1977 (about 22 points per game) and the team's record slumped to 4–7, leading to Dickey's dismissal. Spurrier expressed an interest in becoming Florida's next head coach but was not a serious candidate due to his lack of experience, and Clemson coach Charley Pell was hired soon after conclusion of the season. Pell chose not to retain any of Dickey's staff, leaving Spurrier without a job. Like Dickey at Florida, Rodgers sought to shift Georgia Tech's offense from a wishbone attack to a more passing-oriented offense. And also like Dickey, Rodgers's efforts did not produce immediate results. The Yellow Jackets began the season 1-5-1 and did not score more than 14 points against a Division 1-A opponent over its first seven games. Spurrier, who had not been tasked with constructing a game plan and had seldom been allowed to call plays up to that point, asked Coach Rodgers for a larger role on the staff and was allowed to take control of the offense for the eighth game of the season, against Duke. Georgia Tech surprised Duke with a more aggressive offense than they'd run all year, and the Yellow Jackets won, 24-14. With Spurrier continuing to call plays, Georgia Tech won the next two games as well, scoring over 20 points in both contests and setting a Georgia Tech record for passing yardage in a season. But the campaign ended with a 16-3 loss to archrival Georgia, dropping Georgia Tech to 4-6-1 overall and leading to Rodgers' dismissal. In 1980, Spurrier was hired to be the offensive coordinator at Duke University by head coach Red Wilson, who had been impressed by Spurrier's coaching abilities the previous season when Georgia Tech had upset Wilson's Duke squad. Wilson gave the young coach free rein to design the offense, coach the quarterbacks, and call the plays, and Spurrier met the challenge by developing a record-breaking offense that Duke fans nicknamed "Air Ball". Under Spurrier, Blue Devils quarterback Ben Bennett set an NCAA record for career passing yardage, receiver Chris Castor was named ACC player of the year, and Duke's 1982 team became the first in Atlantic Coast Conference history to average more than 300 passing yards per game. Duke earned two straight winning seasons in 1981 and 1982, a feat that the program had not achieved since 1970 and 1971 and would not achieve again until Spurrier returned as the school's head football coach later in the decade. They also upset Tennessee in Knoxville 25-24 in 1982 on an 88-yard touchdown pass during Spurrier's first return to the state as an opponent. In later years, Spurrier has stated that his seasons working to get maximum production out of outmanned Duke squads were critical to his development as a coach and an offensive strategist. Success at a school not known for its football program also built Spurrier's reputation as an innovative young offensive coach who could improvise and succeed without seeming to work very hard. Duke quarterback Ben Bennett recalls Spurrier diagraming a trick halfback option play with his cereal on the morning before a game, and the play going for a 60-yard touchdown pass that afternoon. During another game, Spurrier devised a new pass play on the sideline which Duke ran for a touchdown on their next offensive possession. Coach Wilson had not seen the play before, and when he asked Spurrier what play he'd called, the young assistant replied "Touchdown, coach." In December 1989, Spurrier accepted an offer to return to the University of Florida as the Gators' "head ball coach." He had privately expressed interest in the job in early October, when Florida coach Galen Hall was fired mid-season for his alleged involvement in an NCAA rules violation and prominent Gator boosters reached out to Spurrier. However, he delayed any further discussion at that time to concentrate on coaching Duke. After the Blue Devils clinched the ACC championship in their last regular season game, Spurrier met with University of Florida president Robert Bryan and athletic director Bill Arnsparger, and he agreed in principle to return to Florida on December 12. Won one national championship (1996), and played for another (1995). A fast start to the 2002 season raised hopes for Spurrier's potential success. The Redskins led off the preseason in Japan, where they beat the San Francisco 49ers 38–7 in the American Bowl. The team threw for over 400 yards and was accused of running up the score, a charge frequently leveled against Spurrier at Florida. The Redskins went 4–1 in the preseason (including a 40–10 win in Tampa against Spurrier's last professional team, the Buccaneers) and won the first game of the regular season 31-23, with Shane Matthews throwing for 327 yards and 3 touchdowns against the Arizona Cardinals. However, subsequent opponents were able to slow Spurrier's offense, mainly by using disguised blitzes to disrupt the passing game. By the end of the season, the Redskins were ranked 25th (out of 32 teams) in scoring offense and finished with a 7–9 record. It was only Spurrier's second losing campaign in 18 years as a head coach, the first being his first year at Duke. Spurrier's disappointing tenure as an NFL head coach has been heavily scrutinized and analysed. During his first season in Washington, Spurrier brought in several of his former stars from Florida, including quarterbacks Danny Wuerffel and Shane Matthews, leading to criticism that he played favorites. Also criticized was his decision to bring along most of his coaching staff from Florida even though they had little or no experience coaching professional football (the exception being Marvin Lewis, who was a veteran NFL coach). As the 2002 season progressed, an increasing number of philosophical, strategic, and player personnel differences began to cause a rift between Spurrier and the Washington front office, including team owner Daniel Snyder. Snyder pushed for the drafting of Tulane quarterback Patrick Ramsey in the 2002 NFL Draft, and though Spurrier said that he would not play Ramsey very much during his rookie season, the coach was pressured to use him by team officials, and Ramsey was starting by game 4. The quarterback position continued to be a source of friction, particularly when, over Spurrier's objections, the front office decided to release Wuerffel before the start of Spurrier's second season. Spurrier later said that he "knew it was over" when he "wasn't allowed to pick the backup quarterback". Spurrier spoke about his NFL coaching experience during SEC Media Days in 2014. "When I left Florida after 12 years, I thought I was going to coach in the NFL five or six years and retire to the beach, and play golf a bunch, and travel around, this, that and the other. But that was a bad plan. It was. Later you found out that was not a real good idea. But that's the way I was thinking back then.". After retiring from coaching, Spurrier further reflected on his NFL stint in several interviews. In a 2016 appearance on the Paul Finebaum Show, Spurrier reflected that the Redskins might not have been the best choice for his jump to the NFL. "I went to the team that offered the most money instead of the best situation", he said. And in 2015, he told David Feherty that, "The owner and the personnel guys, they picked the team. I couldn’t even pick the quarterback the second year. So I knew it wasn’t going to work, but that's ok. I probably didn’t do a very good job, and the situation wasn’t what I was looking for, so it was time to move on." In an interview with The Washington Post in 2019, Spurrier said "I did a lousy job." as Redskins Head Coach but also said "The G.M. did a lousy job. He happened to be the owner, so who needed to go?". 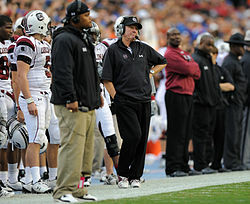 Spurrier won his 100th SEC game on October 11, 2008, coaching the Gamecocks to a 24–17 victory over Kentucky. In his ten seasons as the Gamecocks' head coach, Spurrier has beaten each of South Carolina's traditional SEC Eastern Division rivals at least five times. Against their annual SEC Eastern Division opponents, his ten teams have posted an 8–2 record against Kentucky, 8–2 against Vanderbilt, 5–5 against Tennessee, 5–5 against Georgia, 5–5 against Florida, and 2-1 against Missouri who began competing in the SEC in 2012. Against South Carolina's major in-state rival, Clemson, Spurrier's Gamecocks have gone 6–4. While Spurrier's teams at South Carolina have shown flashes of his old "Fun 'n' Gun" offense, they have mostly relied on stout defense to win upsets. The Gamecocks have been bowl eligible every year Spurrier has been their head coach, a feat no other Carolina coach has accomplished. Also, the Gamecocks have been ranked in the AP Poll Top 25 at some point during the season in nine out of Spurrier's ten years at South Carolina . In April 2018, Spurrier was named the head coach of the Orlando Apollos of the Alliance of American Football (AAF), a new spring football league that was slated to begin play in February 2019. Spurrier was the first coach or player to sign with the AAF, as he thought the four to five month per year commitment made the new league a "perfect job" for him to get back into coaching . The AAF did not finish the season due to league-wide financial difficulties, but as the Apollos led the standings with a 7-1 record when the league shut down, Spurrier and others declared that they should be named the AAF "regular season champions". In July 2016, Spurrier returned to the University of Florida to serve as an ambassador and consultant for the athletic program. On September 3, 2016 the field at Ben Hill Griffin Stadium was renamed to "Steve Spurrier-Florida Field at Ben Hill Griffin Stadium" in honor of Spurrier's achievements at the university. In January 2017, South Carolina Governor Nikki Haley inducted Spurrier into the Order of the Palmetto, the highest honor of the South Carolina government. In August 2017, Spurrier joined SiriusXM Satellite Radio as a college football analyst, co-hosting three weekly programs on SiriusXM Channel 84, College Sports Nation. He has also been a frequent guest on several other radio and TV sports programs, particularly covering SEC football or golf. Spurrier married his college sweetheart, the former Jerri Starr, on September 14, 1966, during his senior year at the University of Florida. They have four children —Lisa, Amy, Steve, Jr., and Scott, as well as over a dozen grandchildren. Spurrier's oldest son, Steve Jr., has been an assistant football coach for several years, including stints as a receivers coach on his father's staffs in Washington and South Carolina. After his father retired in 2015, Steve Jr. joined Bob Stoops's staff at Oklahoma. Spurrier's youngest son, Scott, played wide receiver for the Gamecocks through the 2009 season. Scott eventually joined his father as tight ends coach of the Orlando Apollos. ^ Spurrier set the Sugar Bowl passing record with 352 yards in 1966 Sugar Bowl. This record would not be broken until the 1992 Sugar Bowl, when Florida quarterback Shane Matthews passed for 370 yards, and was broken again in the 1995 Sugar Bowl, when Florida quarterback Danny Wuerffel passed for 394 yards, both under head coach Steve Spurrier. Ironically, both of Spurrier's proteges also lost their record breaking Sugar Bowl contests. The current Sugar Bowl passing record is currently held by another Florida quarterback, Tim Tebow, who threw for 482 yards in the 2010 Sugar Bowl, which Florida won. However, Tebow played for the Gators after Spurrier had left. ^ Florida's athletic administration brought back blue uniforms, installed natural grass, and signed a contract to renew the Miami rivalry before Spurrier's first Florida team took the field in 1990. However, the contract to play Miami was cancelled several months later when the SEC decided to move to an eight game league schedule and establish the SEC Championship Game beginning in 1992. ^ a b c Florida was ineligible for the SEC title, a bowl game, and the Coaches' poll in 1990 due to NCAA violations under the previous coach. ^ Spurrier resigned on October 12, 2015. Shawn Elliott was named interim head coach and led the Gamecocks to a final record of 3-9. ^ The Alliance of American Football folded after playing eight games of a planned ten-game schedule, at which point the Apollos held a two game lead in the standings. ^ "Steve Spurrier: Career Stats at NFL.com". Retrieved September 5, 2016. ^ Maloy, Brendan (August 31, 2016). "Fox News called Steve Spurrier "Head Game Coach"". SI.com. Sports Illustrated. Retrieved April 4, 2019. ^ Pantages, Will (January 9, 2017). "Steve Spurrier Re-enters College Football HOF". floridagators.com. University of Florida. ^ D'Angelo, Tom (October 13, 2015). "Bobby Bowden calls Spurrier 'national champion at needling people'". The Palm Beach Post. Retrieved April 4, 2019. ^ a b Low, Chris (September 4, 2016). "Swamp Sweet Swamp: Steve Spurrier is back home at Florida". ESPN. Retrieved September 4, 2016. ^ Pro-Football-Reference.com, Players, Steve Spurrier. Retrieved July 9, 2010. ^ a b c d e f g h i j k l m n o p q r s GatorZone.com, Football History, 2001 Roster, Steve Spurrier Biography Archived March 22, 2012, at the Wayback Machine. Retrieved July 25, 2009. ^ a b S.L. Price, "Steve Superior", Sports Illustrated (October 23, 1995). Retrieved September 15, 2009. ^ a b c Williams, Trey (October 22, 2015). "Before he was Head Ball Coach, Steve Spurrier was just a kid from Johnson City". The Johnson City News & Neighbor. Retrieved July 30, 2016. ^ Longman, Jere (September 1, 2002). "With Innovation, Winning Is the Only Thing for Spurrier". The New York Times. Retrieved September 4, 2016. ^ databaseFootball.com, Players, Steve Spurrier Archived February 12, 2010, at the Wayback Machine. Retrieved July 9, 2010. ^ a b c d e f g h i j k l m n o p q r s Spurrier, Steve with Buddy Martin (2016). Head Ball Coach: My Life in Football. New York: Blue Rider Press. ISBN 978-0399574665. ^ Haney, Travis (October 27, 2007). "Spurrier's Hometown Conflicted". The Post and Courier. Charleston, South Carolina. Retrieved September 10, 2016. ^ Jenkins, Henry (November 19, 1962). "Sideline Review: Spurrier Widely Sought by Colleges". Kingsport Times-News. Kingsport, Tennessee. Retrieved September 4, 2016. ^ a b Gordon Weidler, "Steve's Story: New Book Unlocks Spurrier Mystery", The Gainesville Sun (September 28, 2002). Retrieved October 13, 2015. ^ a b Henry, Ran (2014). Spurrier : how the ball coach taught the South to play football. Guilford, Connecticut: Lyons Press. ISBN 9780762791842. ^ Siler, Tom (September 11, 1964). "College Football Roundup". El Paso Herald-Post. Knoxville News-Sentinel. Retrieved September 4, 2016. ^ a b McEwen, Tom (1974). The Gators : a story of Florida football. Huntsville, Ala: Strode Publishers. ISBN 978-0873970259. ^ "Harper's Running Sets Florida's Pace". The Progress-Index. AP. September 20, 1964. Retrieved September 4, 2016. ^ Moffitt, David (October 11, 1964). "Floridians Chew Up Ole Miss". News-Journal. UPI. Retrieved September 4, 2016. ^ Land, Charles (October 25, 1964). "Alabama fights off Gators, 17–14". The Tuscaloosa News. Google News Archives. p. 11. Retrieved May 12, 2013. ^ "Spurrier Top SEC Soph". Kingsport Times. Kingsport, Tennessee. UPI. December 15, 1964. Retrieved September 4, 2016. ^ a b c 2012 Florida Football Media Guide Archived May 27, 2013, at the Wayback Machine, University Athletic Association, Gainesville, Florida, pp. 70, 72, 74, 75, 80, 87, 89, 92, 93, 94, 96, 98, 102, 106, 112–113, 116, 122, 124, 129, 136, 141, 142, 144–146, 149–150, 153–154, 155, 157, 165, 171, 182 (2012). Retrieved September 16, 2012. ^ S.L. Price, "Spurrier: Call Me Mastermind", Sports Illustrated (October 3, 2007). Retrieved April 8, 2010. ^ Mabe, Logan (November 14, 1996). "Heisman was Spurrier's 2nd Best Catch". The Gainesville Sun. pp. 1C, 6C. Retrieved November 11, 2013. ^ "Sugar Bowl Record Book" (PDF). Retrieved September 4, 2016. ^ a b c Heisman.com, 1966: Steve Spurrier Archived December 17, 2008, at the Wayback Machine. Retrieved July 25, 2009. ^ 2012 NCAA Football Records Book, Award Winners, National Collegiate Athletic Association, Indianapolis, Indiana, pp. 7 & 14 (2012). Retrieved September 14, 2012. ^ Sports_Reference.com, College Football, 1966 Heisman Trophy Voting. Retrieved April 26, 2012. ^ Dirocco, Michael (September 9, 2005). "SEC EXTRA: Payback's for the 'Dogs". Jacksonville Times-Union. Retrieved September 4, 2016. ^ Low, Chris (September 6, 2013). "Is Steve Spurrier in Georgia's head?". ESPN. Retrieved September 4, 2016. ^ Robbie Andreu & Pat Dooley, "No. 2 Steve Spurrier", The Gainesville Sun (September 1, 2006). Retrieved March 30, 2013. ^ NFL.com, NFL Draft History, 1967 Round 1. Retrieved July 25, 2009. ^ "Steve Spurrier career statistics". Pro Football Reference. Retrieved September 8, 2016. ^ Macomber, Frank (December 24, 1972). "Spurrier Extends 49ers QB Dynasty". The Sunday News and Tribune. Copley News Service. Retrieved September 6, 2016. ^ "49ers to Rely on Passing Game". Panama City News-Herald. UPI. December 23, 1972. Retrieved September 6, 2016. ^ a b c d e f g h i j k Chastain, Bill (2002). The Steve Spurrier Story. Lanham, Maryland: Taylor Trade Publishing. ^ a b Mabe, Logan (November 15, 1996). "Steve Spurrier: #1 Gator". The Gainesville Sun. Retrieved September 7, 2016. ^ SportsIllustrated.com, SI Vault, Sports Illustrated (July 23, 1976). Retrieved July 25, 2009. ^ "Spurrier Puzzled, Disappointed by His Release". The Lakeland Ledger. Lakeland, Florida. April 15, 1977. Retrieved September 7, 2016. ^ National Football League, Historical Players, Steve Spurrier Career Statistics. Retrieved July 25, 2009. ^ "Spurrier Joins Gator Staff". The Naples Daily News. UPI. December 21, 1977. Retrieved July 31, 2016. ^ "UF Fans can thank Vol's AD for Spurrier". Orlando Sentinel. November 29, 2001. Retrieved January 23, 2016. ^ UPI (November 20, 1978). "No Title so Florida Gives Ax to Dickey". The Evening Independent. Retrieved January 23, 2016. ^ a b Hamilton, Brian (1979). "Spurrier Joins Coaching Staff". Georgia Tech Alumni Magazine. 55 (3): 12–13. ^ "Florida football: Gators to rename field after Steve Spurrier". NCAA.com. June 9, 2016. Retrieved September 4, 2016. ^ a b c d Gamecocks Online, Steve Spurrier Profile. Retrieved July 25, 2009. ^ Sigiura, Ken (October 16, 2015). "Did Georgia Tech and Pepper Rodgers keep Steve Spurrier's career alive?". Atlanta Journal-Constitution / ajc.com. Retrieved July 30, 2016. ^ Mell, Randall (September 12, 1993). "Spurrier Enjoys It When He Beats Kentucky". Orlando Sun-Sentinel. Retrieved September 10, 2016. ^ Kendall, Josh (August 17, 2012). "Spurrier: No Ill Will Towards Bill Curry". The State. Columbia, South Carolina. Retrieved September 10, 2016. ^ Holliday, Bob (December 5, 2018). "Three decades later, Spurrier's Duke legacy stands tall :". WRALSportsFan.com. WRAL TV. Retrieved December 9, 2018. ^ a b Holliday, Bob (October 14, 2015). "Steve Spurrier's days at Duke". WRAL.com. Retrieved July 30, 2016. ^ Jenkins, Sally (September 8, 2002). "If Football Is Life, Touchdown Spurrier". The Washington Post. Retrieved October 16, 2017. ^ "The Miami News – Google News Archive Search". ^ Zier, Patrick (December 26, 1985). "Buccaneers are also losing at turnstiles". The Lakeland Ledger. Retrieved July 31, 2016. ^ a b Keeley, Laura (August 28, 2014). "Steve Spurrier still remembers his time at Duke like it was yesterday". The News & Observer. Retrieved July 31, 2016. ^ Matt Hayes, "Spurrier legacy at South Carolina in QB Garcia's hands", The Sporting News (May 27, 2009). Retrieved July 25, 2009. ^ a b Kallestad, Brent (January 1, 1990). "Spurrier Takes Florida Job". The New York Times. AP. Retrieved September 11, 2016. ^ Olson, Andrew (September 3, 2016). "Head Ball Coach draws a crowd at book signing in Gainesville". Saturday Down South. Retrieved February 9, 2019. ^ Taylor, John (March 28, 2018). "Steve Spurrier open to joining new pro league as Head Ball Coach". NBC Sports - College Football Talk. Retrieved February 9, 2019. ^ Jeff Browne, "UF-Spurrier 'merger' everything but official", The Gainesville Sun, Sports Weekend Section, p. 3 (December 30, 1989). Retrieved September 11, 2016. ^ a b Pat Dooley, "It's official; Spurrier is head Gator", Gainesville Sun, pp. 1A & 6A (January 1, 1990). Retrieved September 5, 2009. ^ Associated Press, "Spurrier takes Florida Job", The New York Times (January 1, 1990). Retrieved February 8, 2011. ^ Dame, Mike (May 31, 1995). "Gators Maneuvering to Add Miami to Schedule". The Orlando Sentinel. Retrieved September 11, 2016. ^ Harry, Chris (August 30, 2016). "'HACKS' LOOK BACK AT SPURRIER'S ARRIVAL, GATORS' REVIVAL". floridagators.com. Retrieved September 11, 2016. ^ Associated Press, "Football and Basketball Teams Placed on Probation at Florida", The New York Times (September 21, 1990). Retrieved February 8, 2011. ^ The Gators won the 1984 SEC championship, but were stripped of the title by a vote of the SEC university presidents in the spring of 1985 because of fifty-nine documented violations of NCAA rules by the previous coaching staff. The Gators also had the best record in the SEC in 1985, but were ineligible for the SEC championship because of NCAA probation. ^ S.L. Price, "'96: For The Love Of Gator Nation", Sports Illustrated (October 3, 2007). Retrieved April 8, 2010. ^ a b c Matthew Zemek, "Urban Meyer, Meet 1997 Archived 2011-07-16 at the Wayback Machine", Gator Country (October 18, 2005). Retrieved July 26, 2009. ^ "Offensive Revolution: The Steve Spurrier Fun 'n' Gun", Sports Illustrated (August 8, 2005). Retrieved July 26, 2009. ^ Gatorzone.com, Facilities, Ben Hill Griffin Stadium at Florida Field. Retrieved July 26, 2009. ^ a b c Dave Kindred, "Spurrier dares to imagine always", The Sporting News (January 28, 2002). Retrieved July 26, 2009. ^ Ray Goff responded publicly: "He's a good coach, but I'd like to run into him some night down a dark alley." Jack Hairston, "Spurrier Has Built a Sugar Bowl Legacy Archived 2014-03-25 at the Wayback Machine", Times-Picayune (January 8, 2008). Retrieved July 26, 2009. ^ Associated Press, "Spurrier resigns as Gators coach", ESPN (January 4, 2002). Retrieved July 25, 2009. See also American Rhetoric, Online Speech Bank, Steve Spurrier: Resignation Speech (University of Florida) Archived August 8, 2008, at the Wayback Machine. Retrieved August 30, 2009. ^ SECSports.com, Football, SEC Football Roundup - Saturday, September 2nd Archived September 30, 2007, at the Wayback Machine. Retrieved July 26, 2009. ^ a b SECSports.com, Football, SEC Football Roundup - Saturday, September 30th Archived September 30, 2007, at the Wayback Machine. Retrieved July 26, 2009. ^ Andy Staples, "At Florida, loyalty still runs deep for the Head Ball Coach", Sports Illustrated (November 14, 2008). Retrieved September 10, 2009. ^ Antonya English, "Gators start Ring of Honor with four former greats", St. Petersburg Times (October 1, 2009). Retrieved July 26, 2009. ^ College Football Data Warehouse, All-Time Coaching Records, Urban Meyer Records by Year: 2005. Retrieved July 26, 2009. ^ "Spurrier, No. 22 Gamecocks clinch SEC East title". ^ a b "Schottenheimer out, Spurrier in for Redskins". ESPN. January 14, 2002. Retrieved July 26, 2009. ^ "USATODAY.com – Spurrier preseason era opens with Redskins rout". Retrieved September 5, 2016. ^ "Redskins vs. Buccaneers - Game Recap - August 24, 2002 - ESPN". Retrieved September 5, 2016. ^ "Cardinals vs. Redskins - Box Score - September 8, 2002 - ESPN". Retrieved September 5, 2016. ^ Hack, Damon (December 31, 2003). "Spurrier Resigns As Head Coach Of Redskins". New York Times. ^ Olivia, SM (August 27, 2011). "Saban, Petrino & Spurrier: Why Didn't They Make It In The NFL?". ^ Demasio, Nunyo (July 28, 2003). "Owning Up, Snyder Learns From the Past". Washington Post. ^ Jenkins, Sally (December 10, 2013). "Washington Redskins are being undermined by Dan Snyder's corrosive star culture". Washington Post. ^ a b "Low: Unhealthy culture hurt Spurrier in NFL". December 11, 2012. Retrieved September 5, 2016. ^ "USATODAY.com – Spurrier quits as Redskins coach". Retrieved September 5, 2016. ^ Steinberg, BIll (September 30, 2015). "Steve Spurrier says he couldn't even pick his quarterback during his second year with the Redskins". The Washington Post – DC Sports Blog. Retrieved June 12, 2016. ^ "Spurrier's new plan: Just keep winning". July 15, 2014. Retrieved September 5, 2016. ^ Gaither, Steven J. (April 20, 2016). "Steve Spurrier regrets Florida departure". Sporting News. Retrieved May 7, 2016. ^ Schwartz, Nick (September 30, 2015). "Steve Spurrier reveals he wasn't allowed to choose his starting QB with the Redskins in 2003". USA Today. Retrieved October 28, 2017. ^ Williams, Charean (March 26, 2019). "Steve Spurrier: I did a lousy job in Washington but so did Dan Snyder". Pro Football Talk. NBC Sports. Retrieved March 26, 2019. ^ See, e.g., Mark Maske, "Spurrier Considering Options in Florida", NFL Insider, The Washington Post (October 29, 2004). Retrieved July 26, 2009. ^ "With Zook out, will Spurrier get a call? ", ESPN News Services (October 26, 2004). Retrieved July 26, 2009. ^ David Jones, "Spurrier withdraws name from Florida coaching search", USA Today (November 4, 2004). Retrieved April 8, 2010. ^ Mark Schlabach, "Teams in Fight To Skip Bowls", Washington Post, p. D1 (November 23, 2004). Retrieved September 5, 2009. ^ Viv Bernstein, "With Less Swagger, Spurrier Returns to SEC", The New York Times (November 24, 2004). Retrieved September 5, 2009. ^ Karl Taro Greenfeld, "Meet Mr. Humble", Sports Illustrated (August 22, 2005). Retrieved April 8, 2010. ^ a b College Football Data Warehouse, All-Time Coaching Records, Steve Spurrier Records by Year: 2005. Retrieved July 26, 2009. ^ a b College Football Data Warehouse, South Carolina Opponents, South Carolina Record by Team, South Carolina vs. Tennessee. Retrieved July 26, 2009. ^ a b College Football Data Warehouse, South Carolina Opponents, South Carolina Record by Team, South Carolina vs. Florida. Retrieved July 26, 2009. ^ Ben Crane, "Coach Gives funds to USC: Spurrier's gift seeks to aid renovations of athletic facilities Archived 2014-02-26 at the Wayback Machine", Daily Gamecock (September 6, 2006). Retrieved July 26, 2009. ^ a b College Football Data Warehouse, All-Time Coaching Records, Steve Spurrier: 2006. Retrieved August 26, 2009. ^ College Football Data Warehouse, Florida vs. Mississippi St Archived July 7, 2015, at the Wayback Machine. Retrieved September 4, 2009. Spurrier's Gators lost to Mississippi State in Starkville in 1992 and 2000. ^ College Football Data Warehouse, All-Time Coaching Records, Steve Spurrier Records by Year Archived February 15, 2010, at the Wayback Machine. Retrieved July 26, 2009. ^ Antonya English, "Gators start Ring of Honor with four former greats", St. Petersburg Times (October 1, 2006). Retrieved July 26, 2009. ^ a b c Alex Riley, "Spurrier's past still outshines his future: Battle with best of SEC leaves Carolina, Florida fans pondering legacy[permanent dead link]", Daily Gamecok (November 13, 2006). Retrieved August 26, 2009. ^ a b Michael Aguilar, "Defense uses 'bend don't break' mantra for win: Stops on Tiger offense allow gutsy Gamecocks to wrangle seventh win[permanent dead link]", Daily Gamecock (November 27, 2006). Retrieved August 26, 2009. ^ Jonathan Hillyard, "Victory over rival will spark turnaround for USC: Spurrier says Clemson win could get Carolina ready for future success seasons[permanent dead link]", Daily Gamecock (November 27, 2006). Retrieved August 26, 2009. ^ College Football Data Warehouse, South Carolina vs. Clemson (SC). Retrieved August 26, 2009. ^ Associated Press, "Suitors beware, SC gives Spurrier $500K raise", ESPN (December 2, 2006). Retrieved July 25, 2009. ^ AP Poll Archive, 2006 Final AP Football Poll Archived August 1, 2009, at the Wayback Machine. Retrieved August 26, 2009. In the final AP Poll, the five teams that defeated South Carolina finished as follows: Florida 1st, Auburn 10th, Arkansas 15th, Georgia 23rd, and Tennessee 25th. ^ a b c d College Football Data Warehouse, South Carolina Yearly Results: 2005–2009. Retrieved August 26, 2009. ^ College Football Data Warehouse, South Carolina Coaching Records, Steve Spurrier Records by Year Archived February 15, 2010, at the Wayback Machine. Retrieved July 26, 2009. ^ Pete Iacobelli, "Spurrier holds down Gamecocks expectations", USA Today (August 25, 2008). Retrieved September 11, 2009. ^ College Football Data Warehouse, All-Time Coaching Records, Steve Spurrier: 2008. Retrieved September 3, 2009. ^ GamecoocksOnline.com, Football, "Spurrier, Lattimore Earn SEC Superlatives", (December 8, 2010). Retrieved December 10, 2010. ^ "2013 NCAA College Football Polls and Rankings for Week 17 - ESPN". ESPN.com. Retrieved November 30, 2015. ^ ESPN.com News Services (October 13, 2015). "Steve Spurrier announces resignation". ESPN. Retrieved October 13, 2015. ^ Marx, Bill (April 7, 2018). "Steve Spurrier returns to coaching with new Alliance of American Football". Sporting News. Retrieved April 7, 2018. ^ Knight, Joey (April 7, 2018). "Steve Spurrier returns to coaching". tampabay.com. Tampa Bay Times. Retrieved April 7, 2018. ^ a b Bianchi, Mike (April 3, 2019). "AAF may be dead, but Steve Spurrier doesn't rule out coaching again — maybe in XFL | Commentary". OrlandoSentinel.com. Retrieved April 4, 2019. ^ Owens, Jason (April 4, 2019). "Steve Spurrier claims AAF title at Rick Neuheisel's expense, and a sportsbook agrees". sports.yahoo.com. Yahoo Sports. Retrieved April 16, 2019. ^ Brockway, Kevin (July 29, 2016). "Spurrier named UF ambassador". The Gainesville Sun / Gatorsports.com. Archived from the original on September 17, 2016. Retrieved July 30, 2016. ^ Low, Chris (September 4, 2016). "Swamp Sweet Swamp: Steve Spurrier is back home at Florida". ESPN. Retrieved March 26, 2018. ^ aknittle@postandcourier.com, Andrew Knittle. "Gov. Haley hands out Order of the Palmetto to her staff, agency heads". 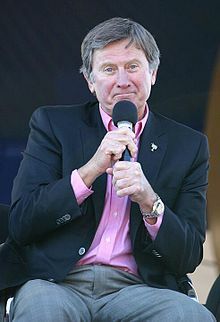 ^ "Hall of Fame Player and Coach Steve Spurrier Joins SiriusXM As College Football Analyst". investor.siriusxm.com. ^ "2010 Steve Spurrier Ladies Football Clinic". thestate. Retrieved October 13, 2015. ^ "University of South Carolina Official Athletic Site". www.gamecocksonline.com. Archived from the original on September 5, 2015. Retrieved October 13, 2015. 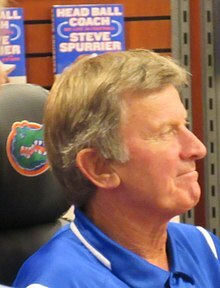 ^ "Steve Spurrier Ladies Football Clinic a Big Hit". South Carolina Gamecocks. Retrieved October 13, 2015. ^ Kersey, Jason (March 2, 2016). "Steve Spurrier Jr. joins Sooners' staff in off-the-field role". The Oklahoman. Retrieved May 8, 2016. ^ Gamecocks Online, Football, Scott Spurrier Profile. Retrieved July 26, 2009. ^ Gamecocks Online, Football, Steve Spurrier, Jr. Profile. Retrieved July 26, 2009. ^ "The Orlando Apollos of the Alliance of American Football Announce Full Coaching Staff". Alliance of American Football. December 10, 2018. Retrieved January 7, 2019. Chastain, Bill (2002). The Steve Spurrier Story: From Heisman to Head Ballcoach. Taylor Trade Publishing. ISBN 978-0878333165. Henry, Ran (2014). Spurrier: How the Ball Coach Taught the South to Play Football. Guilford, Connecticut: Lyons Press. ISBN 978-0762791842. Spurrer, Steve with Buddy Martin (2016). Head Ball Coach: My Life in Football. New Rider Press. ISBN 978-0399574665.